Gluten-Free Naan and an update on freezing the dough! This past week I got together with 3 enthusiastic bread bakers. I’d brought two buckets of dough to work with; the master recipe from ABin5 and the gluten-free brioche from HBin5. From those two buckets we baked everything from an epi and sticky buns to flatbreads like pita, pizza and naan. Charlie, Anne and Carole are very creative and not at all intimidated by bread baking, although they are fairly new at it. I was there to teach them about baking and yet I came away with all kinds of new ideas and inspiration. Out of a request for quick breakfast ideas to feed their kids (some of whom are on gluten-free diets) we experimented with making the gluten-free brioche into a naan. Rolled out in sugar and fried up in butter it was fantastic. The brioche cooked in this way had a crisp caramel coating with an almost pudding like interior. It was so good and easy that it got me thinking about making a more traditional version of naan with the gluten-free crusty boule dough I had left over. It was every bit as delicious as the naan made with our wheat doughs and still as quick. When Jeff and I set off to write HBin5 we knew it would include gluten-free recipes. It was the #2 request from our readers of ABin5, more of a plea than a request. The options for buying gluten-free bread are both unsatisfying and expensive, two qualities we try to avoid. 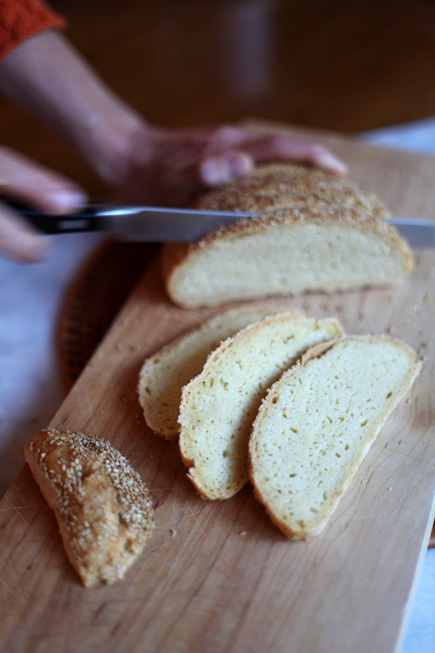 We wanted to create wonderful bread that anyone, celiac or not, would want to eat. Along the way we learned a lot about baking with flours that don’t have gluten, which is what gives wheat breads their desired texture and ability to rise. It took several failed attempts, some sleepless nights and ultimately the advice of experienced gluten-free chef Shauna from Gluten Free Girl before we landed what we think is a dynamite crusty loaf, that just happens to be gluten free: Gluten-Free Crusty Boule. 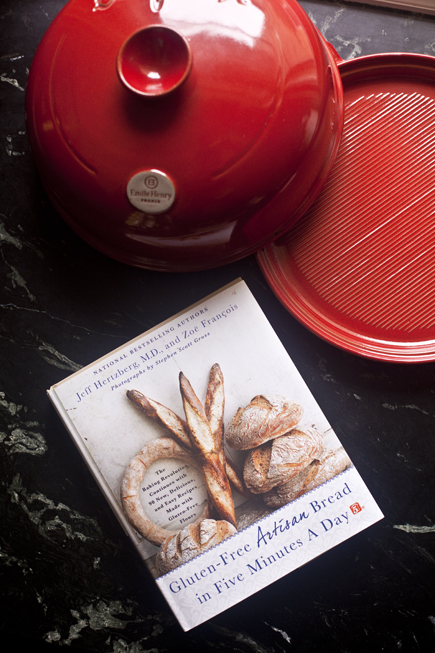 Several readers have asked about our olive oil dough on page 238. While the Crusty Boule has a chewy and toothsome texture, the bread made with the olive oil dough has a much lighter, almost fluffy interior. Replace the neutral flavored oil in the Gluten-Free Crusty Boule recipe with olive oil if you prefer the texture of that loaf. They are both wonderful and give you fantastic options for free form loaves, sandwich breads, pizzas and even crackers. You will find all of these, plus many other gluten-free breads and awesome sticky buns in Healthy Bread in Five Minutes a Day.